This past weekend I was in Soho, going to eat in Little Italy... of course. On my way there, I passed a colorful window that caught my eye. I stopped and Noah turned around to see why I paused. By the time he came back, I was already half way in the door of the cute little bakery that grabbed my attention... The Flour Shop. The minute I walked in the door and saw the rainbow walls and princess chair, I knew I was in the right spot. It only got better once we reached the counter and there were lines of bright cake balls, push pops, and mini unicorn cakes. 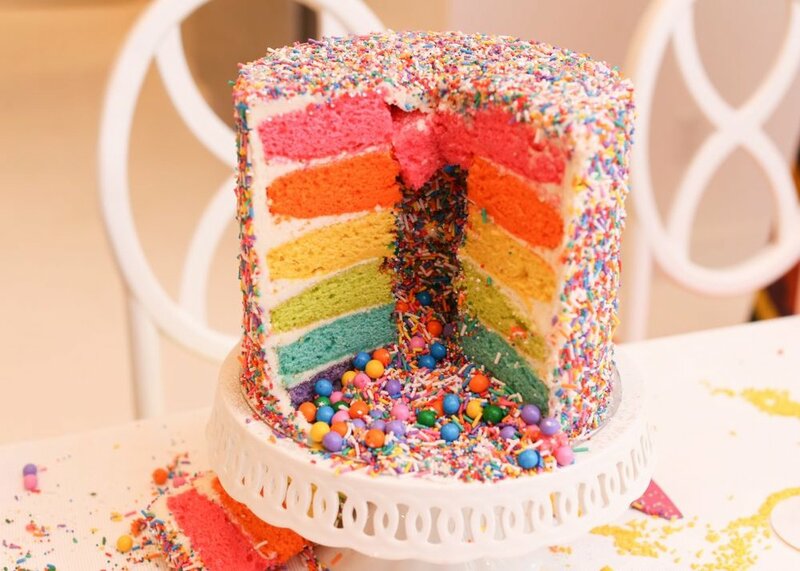 Every layer of the cake was a different color so they matched the rainbow pattern that was everywhere else. Sis you would totally die if you ever came here... with your sweet tooth you'd definitely be making a dent in your bank account. But trust me it was so worth it.